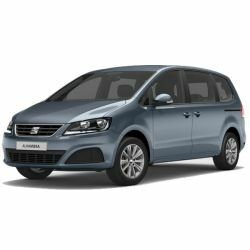 A practical, functional MPV with the style and elegance for which SEAT is famed, the SEAT Alhambra is the ideal choice for families who want optimum safety and great performance, all without sacrificing aesthetics. The capacious interior comes with split folding rear seats for up to seven people, plus a host of practical storage solutions. A range of cutting-edge technological solutions make every aspect of your journey easier and less stressful by giving you a helping hand where needed. Park assist makes light work of tight spaces, while the optional bi-xenon headlamps with Adaptive Front-Lighting System follow the direction of steering and adjust brightness automatically for oncoming cars. When it comes to safety, the SEAT Alhambra is every bit the family car. A multitude of no-nonsense features include up to nine airbags and ISOFIX child seat anchorage points, contributing to the SEAT Alhambra’s five-star Euro NCAP rating.